Why should we even think about the best foot massager? Well, some of us can be outside all day either working or just walking around in general. Of course, it comes to no surprise that our feet will be either aching or sore due to this. That’s why we need to massage our feet regularly to ease this pain and prevent it from happening again. However, massaging your own feet can be repetitive and quite boring to do. You may not get the effect you’re looking for. That’s why top rated foot massager models were invented! In this article, we’ll be going over some useful information you need to know about them, the health benefits that come along and much more interesting facts! We realize that a newbie can have trouble picking the right product, so we’ll be going over our top ten list and give our intake on them to help you out a bit. What Does Foot Massager Do? Who Will Benefit from Using Foot Massagers? Let’s start off by telling you what a foot massager really does. A foot massager is also known as an electrical foot massager. You can use it to relax and to stimulate the muscles within your feet. 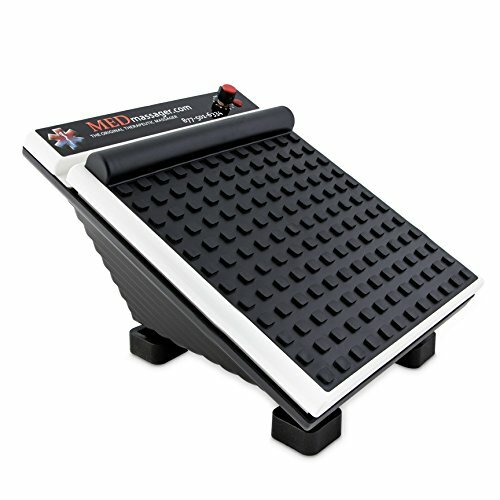 It can also stimulate your calves through the use of vibration, heat and EMS, and rollers. These machines are very efficient and beneficial for multiple reasons. But the main one being that you don’t have to make appointments and travel to a spa. You can get all the benefits at home with an electrical foot massager. 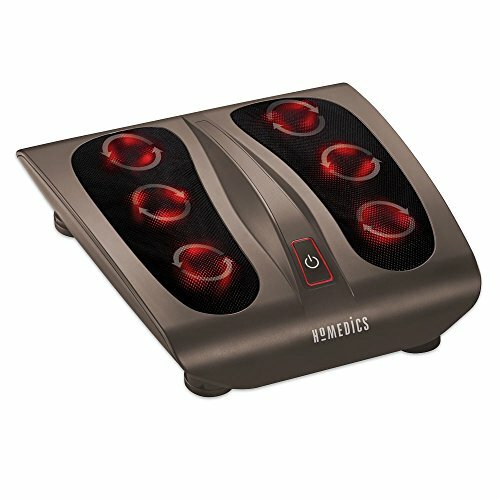 One of the most common questions I hear in regards to the foot massagers is that if it will be beneficial for them? Even if you don’t have any issues or aches within your feet that need treating, there’s plenty of health benefits that you can take advantage of by using them daily. We’ll talk about those benefit later on in the article, but for now, we’ll be listing the type of people who will benefit from these electrical foot massagers the most. When you see athletes train for a specific event, you’ll notice that they tend to take care of their feet well, this is because your feet being in good condition is vital for sports. Runners can easily benefit from this because it will improve the range of motion and flexibility in your feet. Not only that, but it will also reduce the risk of running-related injuries from occurring. People who are suffering from arthritis. People who suffer from arthritis in the foot will be pleased to know that these will help soothe your muscles and sore joints. This will lead to further improvement of your range of motion and will overall help the joins function properly. Since this will reduce the pain and stiffness within the joins, it’s no wonder why many people with foot arthritis use them! Deep massaging within the foot will increase your general blood flow rate, which will reduce the risk of any blood clots from occurring. A good foot massager can do this because it’ll be warming your feet up, so your blood circulation will quickly improve. If you’re unfamiliar with what this term means, it’s essentially an injury that is commonly found within runners. This involves the damage of a muscle called plantar fascia, which is a band of tissue which runs across the bottom of your foot and connects the heel and toe bones. Thankfully within the matter of days, you’ll be able to physically feel the results with foot massagers! So now that we’ve covered the ground about the top foot massager models, now comes the time to decide upon which brand and model you’re going to go with. While it’s true, there are thousands upon thousands of different foot massagers out there that all offer something unique to their users, some are just better than others at the end of the day. We’ve scouted the internet to find the top 10 foot massagers, and we’ll be giving each of them a short review. If all you want is a great massage in a personalized style, this unit is all you need. The greatest selling point of this is the ability to control the entire panel. Talk of vibration, intensity, speed and kneading action you can personalize everything to meet your standards and massage needs. If you have large feet, you don’t have to worry. The system has you covered too, and you can enjoy a massage on both feet at the same time comfortably. It accommodates up to size 14 feet. For people who want to relieve stress, improve blood flow and relaxation, this unit will get the work done better than when visiting massage shops around. Searching across the market, you will never find a massage unit that gives you personal experience. Whether you are looking for an intense professional massage or you just want to relieve muscle stress from a busy day, this is the way to go. 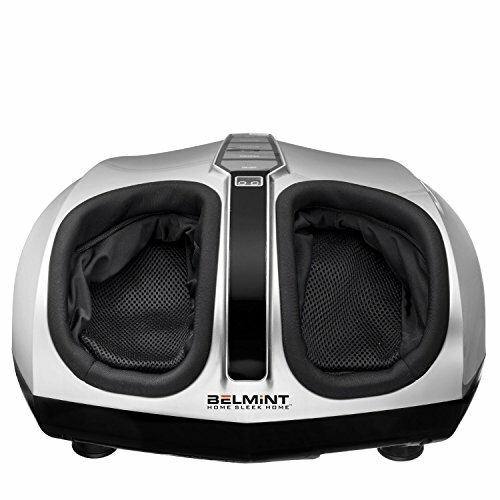 If you are looking for a therapeutic massage experience on the top of the feet, then this unit will disappoint since it only gets the work done at the bottom and sides of the feet. You don’t have to spend lots of money trying to find pleasure and relieved experience. Instead of the on and off trips to the massage centers, you can invest in getting this unit at home and enjoy the work at a personal level. Feel the difference and love the experience. It also improves in the house decoration with its sturdy design. 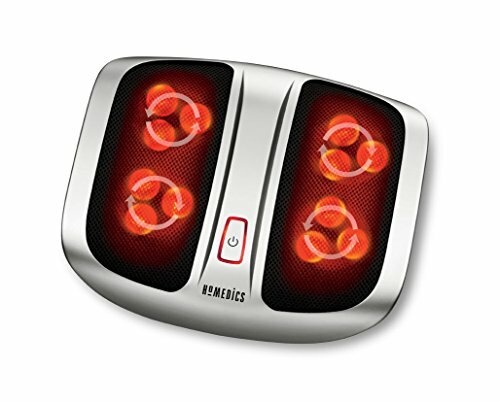 Starting off the list, we have the Homedics Deep Kneading Shiatsu Foot Massager! Just by looking at the design you can tell it was designed with the future in mind, it looks like it’s from some sci-fi movie. But let’s talk about what this bad boy can do. Other than the fact it’s very cheap and light on the wallet, what does it offer? 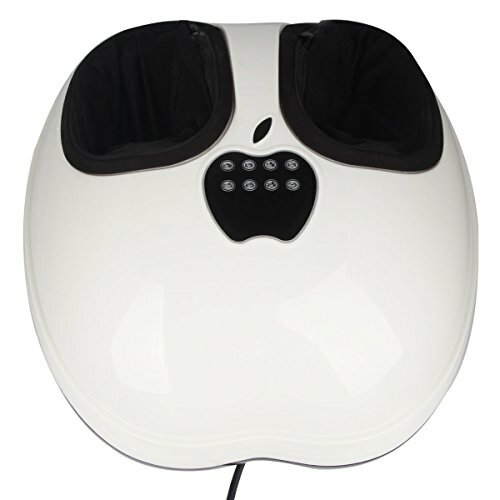 One of the main reasons why this is a very well-loved because it provides stress relief for even the most worked feet! With just 10 minutes of use a day, you’ll begin to see quick improvements. It’s extremely lightweight. You don’t have to worry about being glued to one location within your house; it’s easily portable. Because this particular model sits flat on the floor, it may be difficult to hold your feet against the massager. While you can use some object like a book to hold the machine on a tilt, there should be something incorporated into the device. To give this massager a rating, I’d have to give this a 4/5. There’re chances for improvement in many ways but never the less it’s still a great product! It’s directed to those with moderate foot pain rather than crucial pain. Maybe a high-tech foot massager isn’t what you’re looking for? If you’re most into simplistic products that do the job just as well then you’re looking at the right product. Nothing beats a manual foot massage. Of course, the more effective and costly method would be to visit a spa and get a massage from a professional, but for those of you on a budget, one of these massage rollers will do the trick almost as well! It’s a very sturdy and comfortable device. The good thing about these types of massagers is that you’re in total control of the pressure of the massage. It has tons of features and benefits and will overall fix aches and sores fairly quickly. Can be quite noisy (squeaky) at times and doesn’t have as many features or as much appeal as the electronic foot massagers. Very simplistic and basic while being just as effective as any other electric massagers, but has less to offer than them. Still great never the less. If you believe you have a variety of different issues within your feet, then the HoMedics FMS-200H Shiatsu Elite Foot Massager Will help you get relief from the pain. Unlike many other massagers, this particular one is very quiet, making it great for using it late at night without worrying about disturbing the sleeping people in the next room! This massager is also very realistic; it will feel like someone is genuinely giving you a foot massage if you close your eyes. Other than the cool features, this device does not operate using batteries. So yes, you are quite limited to where you can use this, but you’ll be saving money and time not having to go out and buy batteries all the time. This product Is quite fragile. If you were to stand on it, it would break almost instantly. This is because it was designed to be used sitting down. Diabetic people are also unable to use this machine, unfortunately. Overall, this machine is highly praised by its customers, but me personally I’d give this a 4.1/5. Can be made user-friendly in many ways but still, a great product and very cheap for what it offers! This electronic foot massager is no joke! It’s one of the top rated foot massagers on the market right now, and customers almost always say positive things about it. What makes this product more appealing is that doctors and therapists use this on their patients having problems with their feet. With this product being used on a professional level by many people around the world, it’s definitely a safe purchase. MedMassager MMF06 is perfect for dealing with circulation issues, diabetes, pain relief, and for just soothing, relaxing feeling. The angle of the device is designed to be very comfortable as well! Full-sized oscillating Foot Pad with Arch-Bar and a pressure point targeting surface. Used by patients with diabetes and neuropathy to promote healthy blood flow and ease the pain. Rugged, reliable construction. Comes with a kit for use on hardwood and tiled floor. Everything about this product! It’s well designed, very reliable, and to say it’s being used by doctors, it’s safe to say it works! The only negative thing I could say about this product is the high price tag. Also, durability seems to be an issue with this product. Some have reported loud noises after around a month of use. Speaking on behalf of pretty much everyone who has used this, I’d give this a 4.4/5. A really great product that will be hard to top. This electronic massager has an incredibly advanced design which definitely looks like it’s from 30 years from now! Using this product is just as useful as going to a spa. It’s quiet, feels comfortable, and is genuinely a luxury massager. Other than the great features, this product is very easily affordable, great for those on budgets! The additional heat function is awesome. Nothing feels better than heat on the feet. It also has 18 different massage modes! It does not seem to surround the entire foot, only a portion. The massage is also not as deep as originally advertised which is quite disappointing. To summarize everything up, this is an amazing foot massager, definitely one of the best out there right now. I’ll have to give this a 4.7/5 for its incredible features. It can be obviously improved, but as it is right now, it’s good enough. This is designed ergonomically to cover all your foot pressure points for extra soothing effects. A lot of other massagers on this list can be fairly harsh on the feet, but this one has in-air pressure massage, still as effective, but a little less harsh on the feet. Multifunctional massager features with Shiatsu massage, kneading massage, rolling, and air pressure. 360 all cover massage, 3D press massage. Ergonomically designed to tackle the distribution of the feet acupuncture points for a professional-feeling massage at home. 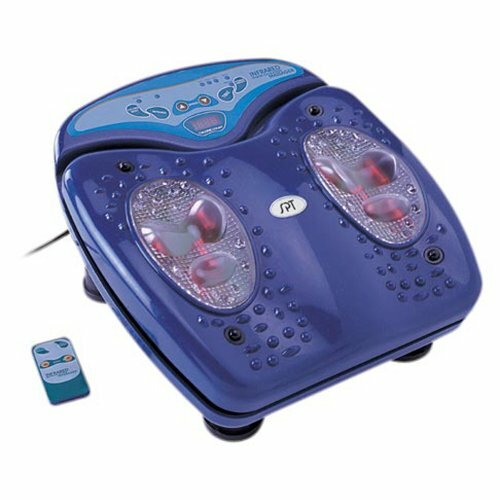 Choose from three different modes, adjustable massage strengths, and speeds to improve metabolism and blood circulation. Air pressure massage on in step with a rolling massage with heating on the feet soles allows for a massage that is LESS RIGOROUS than a mechanical massager, but just as effective. This has a multifunctional massage feature which you can control manually. It’s very lightweight, making it portable and it’s easy to use! The majority of massagers seem to lack the human touch, but this one seems to feel as realistic as it can get. Can be rather painful at times since it grips onto the toes and can be tight sometimes. Overall, I’d personally recommend this to anyone who needs or wants a regular foot massage. More on the pricey side, but worth it to say the least. The Infrared Blood Circulation Massager by Sunpentown is a massager that includes very helpful features like a high-frequency vibration and powerful magnetism. It also includes an infrared treatment that helps increase the strength of the body to reduce chances of sickness. Most importantly, this device aims to enhance blood circulation and avoids any blockage on blood vessels. This massager includes a few treatment options which you wouldn’t be able to find in many other products! If you’re looking for relief both foot and leg pains at all, then this is what you’ll be wanting to pick up. There are very little negative things to say about this one, but one thing I will say is that the remote needs to be made slightly more user-friendly. It’s also rather heavier than others on this list. This Infrared Blood Circulation Massager is designed to be just for both the leg and foot. Since it is more on the heavier side, you might have a few limitations to how and where you can use it, but other than that its very effecting for soothing foot and leg pains. If you suffer from Plantar Fasciitis (as discussed before), flat feet, bunions, or any other conditions that affect your feet and cause pain you will find great relief in a massager. Shiatsu and heat are two of the most effective treatments for foot pain. 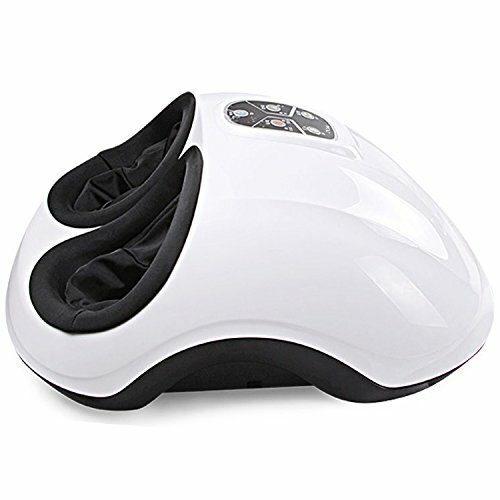 Foot massagers and other like it are designed to give you a general environment of relaxation. Using this for 10 minutes a day can have benefits for you. 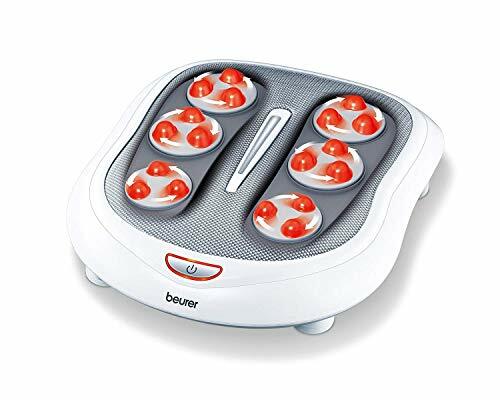 If you’re somebody that only really use massager for a few minutes a day, this is the best at home foot massager for you. The Shiatsu Foot Massager with Heat offers flexible massage and heating options to tailor to your needs. It’s also extremely lightweight, which makes it best to travel with. It’s also one of the best machines out there that will efficiently relief your foot pain. More on the pricey side, but defiantly worth it. What’s more to say? It’s a great product that is very easy to use and does its job well. It is high time that you go for a foot massager which does not only offers brilliant result but also comes with a great look and design to make your life a lot easier. This product is exactly that. The 3Q MG F18 massager from the brand 3Q has everything to make you go WOW. The great look is a huge pro to have in a massage chair. We are not saying that you will be displaying this product to everyone and be happy about it. But the look or the design aspect will help you to gain better experience from this massage unit. This is one of the best massager, but there are cons to know about it too. As this is a high tech product, there can be technical errors though the warranty is there to cover you. Also, if you want to take long massages while you are sleeping then the machine won’t allow you to do so as it sleeps after 15 minutes of being used. So now that we’ve gone over some of the top rated foot massagers. Let’s talk about some of the health benefits that come along with massaging your feet daily. It’s something that will motivate you to massage your feet, right? Want to give yourself a foot massage? Read here: How to Give Yourself a Foot Massage? Pinpointing your pressure points is fairly easy to do. If you press on them before going to bed on a night, this can help relax and unwind. Another way to do this is to use some lubricant like olive oil and massage the bottom of your foot for 10 minutes before sleeping. Make sure to hit your pressure points while doing so to see results! Studies have shown that massaging your feet can improve your blood circulation. Well, I’m here to tell you that it does. Throughout the day, a majority of us don’t use our feet muscles correctly. Also, some of us do not wear the correct footwear (e.g. Too tight) which can cause circulation problems. A quick massage a day on your feet can solve this. Particularly with reflexology, studies have shown that this system of massaging does go well beyond just relaxing at night. The studies had cancer patients go through this massage system, after several weeks, depression rates within these patients started to decline. With that being said, this is one way for anybody suffering from anxiety or depression to effectively deal with them. A study that was undertaken in Denmark showed us that various of people that suffer from migraines and headaches showed a great improvement when they received reflexology treatments. The test subjects that were already taking medication stopped taking it after starting this treatment. A massive 65% showed to have reduced symptoms whereas some had been completely cured! Just goes to show that a foot massage a day truly can keep a doctor away. So now that we’ve covered the basics and gone through some of the top quality massager models, I think now is an appropriate time to inform you of the many different types of foot massagers that can be bought. We’ll be going over the different types and what they do differently. If you do a lot of walking or running, both your feet and claves may become sore if you find yourself doing it a lot. You may feel like the muscles in your legs are knotted. The leg and foot massager is designed to cater to that; I used a kneading action that I can control, giving you the ideal pressure. The shiatsu foot massager is a natural alternative to going to a spa which was first used in Japan. This was designed and is ideal for people that have critical stress levels or have a bad case of the blues. This type of massager has rotating heads to give you as much comfort as possible. Additionally, they also have infrared heating to make it feel like a natural massage. Massage sandals are designed and beneficial for people that have pains in their lower back. These foot massage sandals provide additional support while you’re walking to help you keep your feet cool and dry. You can get these in two different forms: Open closed toe, or waterproof. This ultimate all in one-foot massage includes features such as different speeds, water pressure, and also heat. The foot spa is designed to give you both a hot and cold massage to help you with blood circulation within the feet. It’s also great if you’re just looking for a bit of indulgence. This type of foot massagers is usually the most expensive. So now that you’ve got your eye on a foot massager, you first need to make sure it’s the right one for you! Believe it or not, there are a few aspects you need to consider before purchasing one. Things such as fit for purpose, ease of use, and portability all come into mind, don’t they? Let’s go over a few things below. Some foot massagers offer different features than others, and some are only designed for one specific purpose. Most of them, however, are designed to relax you and provide stress relief. Other provide benefits such as improved blood circulation, reduction of inflammation etc. Choose wisely. Truth be told, a majority of foot massagers are extremely lightweight and can easily be moved from location to location. But here are some that aren’t so much light, and can be a hassle if you intend to travel with them. One more thing to consider with this is that if you’re elderly or consider yourself to be weak, then carrying these around will be challenging. Be sure to focus on those models that are labeled as lightweight for reassurance. Prices of foot massagers can vary depending on what’s packed inside of them and what features they offer to the users. Usually the more expensive, the better they are. If you’re somebody that’s on a budget, for example, you’ll want to do some research before buying the cheap one. While it will save you some pounds, will it save you money in the long run? Cheap often means unreliable and can lead to having to replace your foot massager within a month or two. Depending on whether or not you consider yourself tech savvy, some foot massagers can be quite complex; the elderly can have a hard time operating these if you happen to get one with a complex mechanism. There are some out there that you can operate with your toes (making it very easy) but there’s also some out there that operate differently. Be sure to read the features list on the product to make sure it’s the right one. To summarize everything that we said in this article, everyday life can be tough for us all, especially when we’re on our feet all day working. It’s even worse for those who suffer from either joint, bone or muscle pain. Buying the best foot massager should be necessary for your life if you have the budget to afford one. Of course, massaging your own feet with your hands would work as well, but not nearly as well or luxurious as foot massagers. You can use them to relieve pain, and of course, help with fatigue. As we’ve already discovered, there’s plenty of different models out there that provide different features. These can range from very basic, to manual types such as rollers (appeared in our reviews list) to the highly sophisticated spas. Before going ahead and purchasing a foot massager, do your research and make sure it’ll be fit for your purpose since there is a lot of different types, brands, and models out there! Most importantly, have fun and choose your foot massager wisely!